The discovery of Cape of Good Hope — a geographic location with one of the most romantic names in the world — is due to Portuguese navigator Bartolomeu Dias. At the end of the 15th century Portugal was literally obsessed with discovering the seaway to India sending one expedition after another. In 1487 this task was entrusted to Dias. His voyage, as well as his predecessors', was filled with adventures, shooting incidents with local tribes, and threats of mutiny from his crew. Dias ended up sailing only around Africa thinking that if one continues to sail forward, he would arrive to India sooner or later. After coming to this logical conclusion he turned around, and on his way home in May of 1488 he landed at what he thought was the southernmost point of Africa. However, the heroic deeds of the explorers were not in vain, as now humanity possesses not only the sea route from Europe to India but also an outstanding tourist "attraction". Who wouldn't want to boast about standing on the most southern point of the African continent gazing at the vastness of the ocean and knowing that the only closest land is Antarctica? Even this change didn't go without a trick! 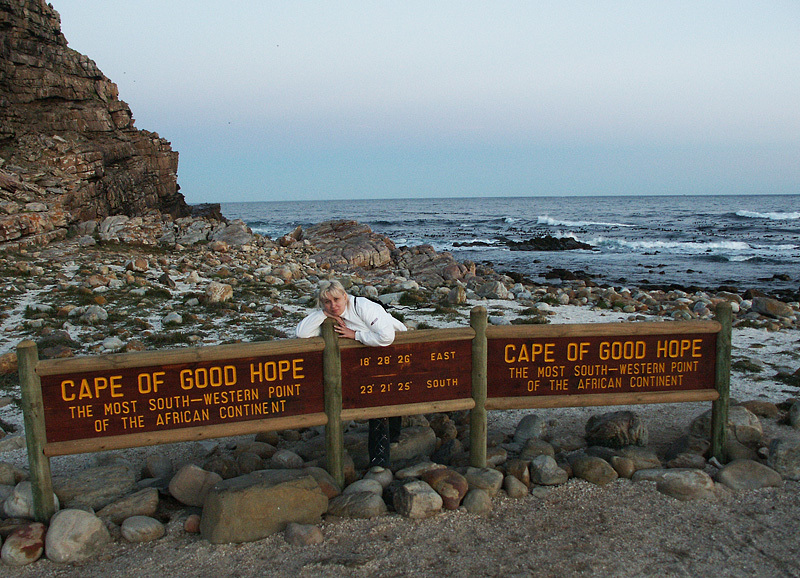 After arriving to Cape of Good Hope by bus tourists first ride the cable cars, then take a long walk to a high, beautiful, long stretching outbound cape with a panoramic view of the mirror-like ocean, where they take classic photos in "Me and The Most South-Western Point of Africa" style. However this cape, named Cape Point, is not really the most southwestern one. Visitor of our website has pointed that the official sign says wrong latitude (23 degrees instead of 33). Photo above with wrong sign was taken in 2003. We found photo in the web of this sign of 2006, there you can see that wrong coordinates have already been fixed.